Nicaragua has great expectations for the Grand Canal, a US$50-billion, 5-year project to link its Caribbean and Pacific coasts with a 280-kilometre waterway. President Daniel Ortega and other supporters of the canal, who celebrated the start of construction on 22 December, say that it will generate much-needed income for residents of the second-poorest country in the Western Hemisphere. But the plan has attracted protests from residents along the proposed route and from scientists around the world (A. Meyer and J. A. Huete-Peréz Nature 506, 287–289; 2014), who charge that the Nicaraguan government and the Chinese company overseeing the project have sidestepped the environmental review process. With the release of a social and environmental impact assessment delayed from November 2014 until April, an informal group of researchers has banded together to produce what it says the government has failed to deliver: an independent evaluation of the project’s potential impact. Normally, before a major infrastructure project begins in Nicaragua, an independent commission would generate an environmental impact report and the environment ministry would take 6–8 months to review it and make recommendations, says engineer Víctor Campos, director of the Alexander von Humboldt Centre, an environmental non-profit organization in Managua. But those rules do not apply to the canal: a law passed in 2013 exempts the project from standard environmental review. HKND, the Hong Kong-based company that is building the canal, has commissioned its own assessment. The company says that a draft will be available for public review this month, with a final report in March or April. In November 2014, the company delivered an eight-hour presentation in Managua that critics say largely played down potential environmental impacts. A government spokesman did not reply to requests for information about the review process. Scientists have therefore assembled an ad hoc review process of their own. An assessment completed in September by the Humboldt centre concluded that the canal would cause “very significant environmental impacts”, and probably would not have been approved under Nicaragua’s usual rules. And in November, participants at a scientific workshop in Managua hosted by the Nicaraguan Academy of Sciences came up with a list of environmental concerns about the canal project. “We can’t offer any advice, but we can pose the important questions that anyone should answer before embarking on a project this big,” says water-conservation researcher Luís Zambrano of the Autonomous University of Mexico in Mexico City, who was one of the 13 international scientists invited to the workshop. Topping the list of concerns are potential impacts on Lake Nicaragua, the largest lake in central America, which will be dredged to a depth of 30 metres along a 105-kilometre channel. By churning up bottom sediments, the dredging and subsequent maintenance of the channel is expected to make lake waters more turbid and decrease their oxygen levels. Projected consequences include fish die-offs and blooms of blue-green algae that could make the water undrinkable. The construction plan also calls for creation of a 400-square-kilometre artificial lake near the canal’s Caribbean terminus. Researchers have expressed concern that this lake would open up the nation’s waterways to invasive species, as has happened in other such development projects (see ‘Suez expansion’). About 2% of Nicaragua’s people live along the Grand Canal’s proposed route. The Humboldt centre estimates that the canal zone will pass through or near 282 communities, including a large tract of indigenous communal land. The canal concession gives HKND the right to seize this and other land, and Nicaraguans far from the canal route have reported visits to their land by Chinese surveyors accompanied by Nicaraguan military escorts. 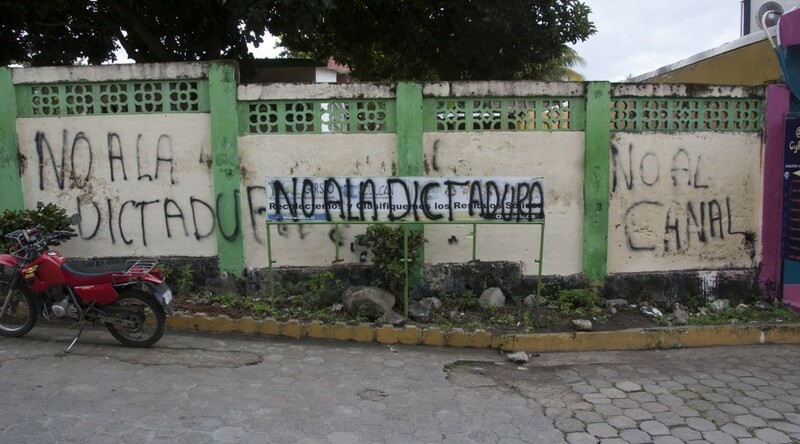 In mid-December, people marched in Managua to protest against the canal project. In 2007, Ortega promised citizens that he would not risk the waters of Lake Nicaragua for all the gold in the world. This October, he said that he had come around to the idea of the canal because it would be the country’s fastest route to economic development. The nation’s public sector stands to benefit from the deal: HKND will pay the government $10 million annually for the first 10 years of the canal’s operation, and hand ownership of the canal to the government gradually at a rate of roughly 10% per decade to a maximum of 99%. First published by Nature: [html] [pdf].